Is It Better Than Raw Garlic? 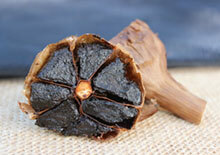 Black garlic has a long history of use as a prized medicinal and culinary superfood in several Asian countries, primarily Korea, Japan and Thailand. Utilized today for its distinct flavor and texture as a gourmet ingredient, it is also becoming popular for its exceptional nutritional value that in some aspects supersedes the raw garlic it was created from. Made from whole unpeeled Allium sativum bulbs, it is allowed to age for a period of time, eventually darkening the bulbs and turning the cloves a dark black licorice-like color.